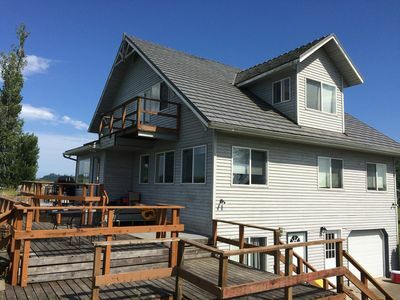 Spacious, Family Friendly House, Ocean Views, Cannon Beach, Walk to the Beach! 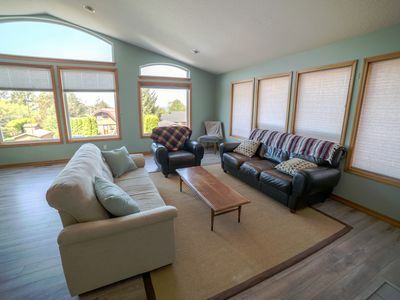 Right up the street from Tolovana Beach in a quiet, south Cannon Beach neighborhood! Views of the Pacific Ocean from living room and deck! Game room downstairs with foosball table and air hockey in the garage! 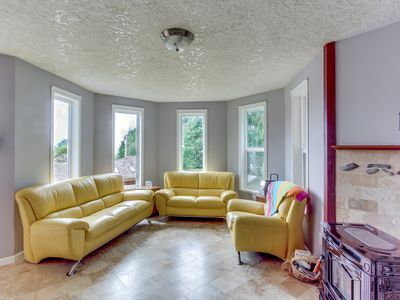 Big, fully equipped kitchen, large fenced yard, gas BBQ, WiFi, HDTV with Netflix. Great for family reunions, retreats, fun with family and friends. Lots of sunlight by day and starlight by night! The Perfect Place for fun family gatherings! Pets are welcome and the home sleeps 12 people. If you're inquiring about a shorter stay than 4 nights feel free to reach out and sometimes we can accommodate that! For the most up to date calendar and pricing discounts please visit. The main level is on the second story and throughout has vaulted ceilings, skylights and lots of natural sunlight. The open living/dining area is adjacent to the fully equipped kitchen with Insta-HOT water for your Hot Cocoa and Tea convenience! WiFi allows you to stay connected when you wish. Relax in front of the gas fireplace, curl-up in a comfy chair and read a book. This level opens to the wonderful deck, where you can take in the views of the Pacific Ocean and breathe in the fresh ocean air while you relax in the sunshine by day and stargaze by night! There are 2 bedrooms on this level each with vaulted ceilings. The Master bedroom has 2 Queen Beds and an adjoining Master Bath with step-in Shower, Jacuzzi Soaker Tub and double sinks. This room has private access to the deck. The other room has a Queen Bed with access to the hall bathroom with tub/shower. Stairs off the deck lead to the fantastic, fenced, grassy yard, as well as the parking area. The downstairs has 2 bedrooms (each with a Queen bed), Full bathroom with tub/shower combination and a spacious, fun game-room. The kids will love the Foosball and Air Hockey tables in garage! 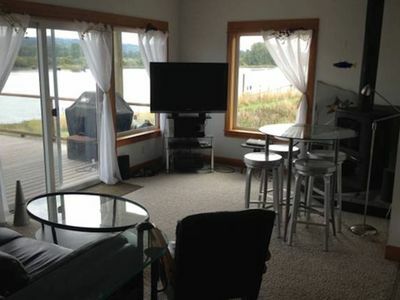 You ll put Captain s Quarters on the top of your list for a lovely getaway home at the beach! Check-in is after 3pm and Check-out is by 11am. Talk a short walk to the sandy beach and spend awhile exploring majestic tide pools with views of Haystack Rock. Cannon Beach is a vibrant bustling town full of quaint shops next to modern galleries and high class restaurants! 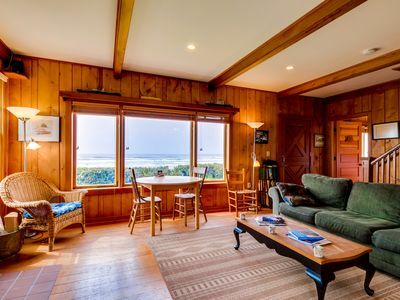 Whether you want to get out and explore, or simply let the stress melt away, this Northern Oregon Coast vacation rental has everything you ll need to an amazing getaway!